For this assignment, we had to work with an Arduino. I was very excited for this assignment because it was my first time working with Arduinos. This assignment was very interesting, and I had a good time creating circuits, with Arduino in it. In the class, we worked on two to three different examples. In all the examples, understanding and changing the code was not at all challenging for me. Sometimes, I faced bit of a challenge in creating circuits and understanding the entire resistor logic in the circuit. However, the entire process went smoothly. From the exercises that we did in class, the one exercise that made LED fade, based on the touch pressure, was very cool. It was very fun to change lines of code and see how the entire behavior of the LED changes. For the second part of assignment, I created a circuit, whose input was a photo-resistor and output was an LED. The central idea of this project was that the brightness of LED will increase as the darkness in the room increases. If there is more darkness, the LED will be more bright. To create this circuit, I used a photoresistor, a LED, an Arduino, one 320 ohm resistor, one 10k ohm resistor, a breadboard, and few wires. The entire process was pretty straightforward. Since, there were may options available for input and output, I was a bit confused on what to chose. In the beginning, I chose photoresistor, and constructed the activity based on that. 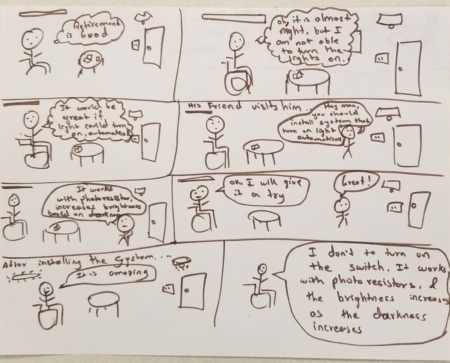 For the storyboard, I designed it to give an idea on how it will help people, who may not be able to walk, turn on the light. Overall, the entire assignment was very interesting and a good learning activity. I enjoyed the process.